Shown here is the USAT ST. MIHIEL, as she was between the wars. The Hog Island "B" Class ships as they were known were designed as Army transports during WW I. Intended to be a very large class of ships, in the end, all but twelve were cancelled because of the abrupt end of the war. Of those twelve, all completed after the war, three, ARGONNE, WRIGHT and CHAUMONT went to the Navy, and the other nine became Army transports. After a few years, the government sold off five ships, which became civilian liners known as the "American Banker Class." The five all had names starting with "American" and saw long and varied service. Four, the ST. MIHIEL, CHATEAU THIERRY, CAMBRAI, and SOMME remained in Army service. In 1931, the latter two ships were exchanged with the United States Lines for their liner REPUBLIC, which then became an Army troopship. ST MIHIEL and CHATEAU THIERRY soldiered on until WW II when they became Navy troopships, then eventually hospital ships. These two and the other three Navy ships all survived the war. Unlike the Navy's transports, which were painted gray, the Army painted its transports white and buff between the wars. These colorful ships engaged in regular trips to U.S. bases and ports in the Pacific, Far East, Alaska, and the Caribbean. To "convert" CHAUMONT to ST MIHIEL or another of her sisters all that is needed is a paint job. 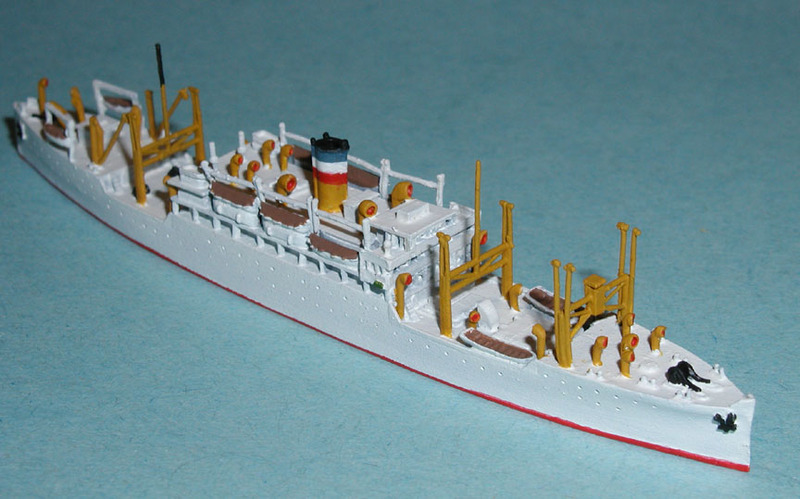 Likewise the model can also be repainted as one of the seven civilian liners. Of these seven ships only one survived the war, sailing under a variety of owners and different names until scapped finally in 1959. It is my intention eventually to do several versions of this class, as the seaplane tender WRIGHT, as an armed AP in WWII, and possibly as a U.S. Navy hospital ship. Each of these variations require more than just paint however.